NTSB cited lack of FTA oversight, "anemic safety culture"
Rescue workers respond to the site of two Metro trains that collided with one another between the Fort Totten and Takoma Park stations June 22, 2009. Supporters of a bill that would give federal regulators power to force transit agencies to make safety improvements are rallying around a ruling that the lack of federal oversight contributed to the fatal Metro crash in Washington last year. Supporters believe the National Transportation Safety Board's strong language favoring federal oversight will make it easier to convince lawmakers that it is needed nationwide. But Sen. Tom Coburn, R-Okla., put a hold on the bill after it was introduced last week to keep it from being fast-tracked through Congress. A faulty electronic circuit was blamed for the crash that killed nine people, but the NTSB said Tuesday that Metro's "anemic safety culture" and the Federal Transit Administration's lack of authority to oversee safety contributed. The board said previous attempts to get Metro to organize its safety operation failed because federal safety oversight is lacking. NTSB Chairwoman Deborah A.P. 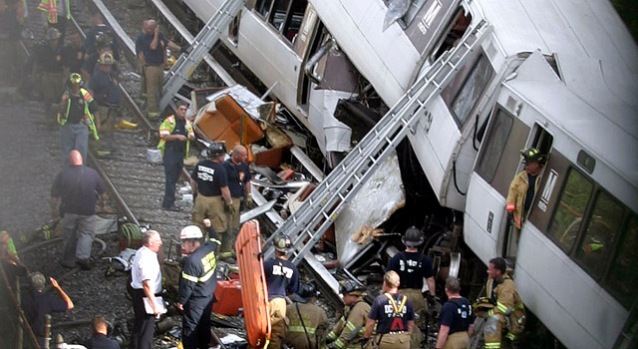 Hersman briefed the Washington Metro Area Congressional Delegation on the Metro crash report Friday afternoon. Afterward, House Majority Leader Steny Hoyer, D-Md., said he and other federal lawmakers will work with local jurisdictions to make sure all NTSB recommendations are implemented and Metro has the resources to follow them. Hoyer called the transit system "America's subway." "This is not a local issue per se," he said. "This is an issue of our nation's capital and the citizens of our nation and visitors to our nation from abroad." "Making Metro safer is a way of honoring those who died," he said. Sen. Barbara Mikulski, D-Md., said after the briefing that the NTSB has provided them with a roadmap for improving Metro safety. "We now need to report for duty and get change under way," she said. She said she plans to speak directly to Coburn to persuade him to lift the hold on the Public Transportation Safety Act. The $66 million bill, which is now before the full Senate, would give the transportation secretary authority over public transportation safety, require transit agencies to establish comprehensive safety plans and improve the effectiveness of state safety oversight agencies. However, Coburn's hold on the bill could block it indefinitely. He puts holds on all bills that spend new money that is not offset elsewhere in the budget, according to spokesman John Hart. The NTSB's findings are a legitimate consideration, but Coburn also is skeptical of the federal government's ability to improve public safety from the top down and concerned about any burden it might put on states, Hart said. The FTA has been barred from regulating the operations of transit systems since its creation in the 1960s because it was seen as a local matter. The FTA's only tool to sanction an agency is to withhold 10 percent of funding to the entire region, said FTA Administrator Peter Rogoff. That step is rarely taken and often the solution to a problem is not less funding, but more, he said. Currently, state agencies oversee safety in transit systems and they want any federal oversight to build on what already exists at the state level and include adequate funding, according to American Public Transportation Association government relations Director Paul Dean. APTA, which represents transit agencies and organizations across the country, worked with the Obama administration and the Senate Banking Committee to ensure legislation takes those concerns into account and that federal law would pre-empt state law and regulations for the sake of uniformity. It's not clear what effect the NTSB's findings in its Metro crash report will have on the debate. It keeps it in the forefront," Dean said. "But it remains to be seen what impact that it will have." The FTA's Rogoff and Transportation Secretary Ray LaHood were motivated by an overall increase in crashes around the country, including the Metro crash and other high profile crashes in Boston, Chicago and San Francisco, and the aging of transit systems around the country. "There's no question that the Metro crash was a major event that focused Secretary LaHood and me on a long-standing gap in federal safety oversight," Rogoff said. Transit is seen as one of the safest modes of transport, but steps need to be taken to make sure it stays safe as systems age, Rogoff said. House Committee on Transportation and Infrastructure spokesman Jim Berard said the House could pass the bill this year if bill supporters in the Senate are able to convince Coburn to lift his hold.